For this week’s debut of FIRE’s new Student Defenders program, we’re profiling students already helping peers accused of conduct violations navigate their school’s often confusing disciplinary systems. Today, we feature an interview with Ohio University’s Sam Flannery, the outgoing director OU’s Students Defending Students. (Since graduating in April, Sam has joined FIRE as a full-time staffer. You might also remember him as a former FIRE summer intern.) We talked to Sam just before he finished his time at OU about his experiences as a student defender. Some questions and answers have been edited for length and clarity. FIRE: Tell us a little about Students Defending Students and how you got involved. Sam Flannery: I joined Students Defending Students as sophomore. I actually heard about the organization through Isaac Smith’s FIRE lawsuit — the “We get you off for free” T-shirt case. The week I heard about that, I applied. 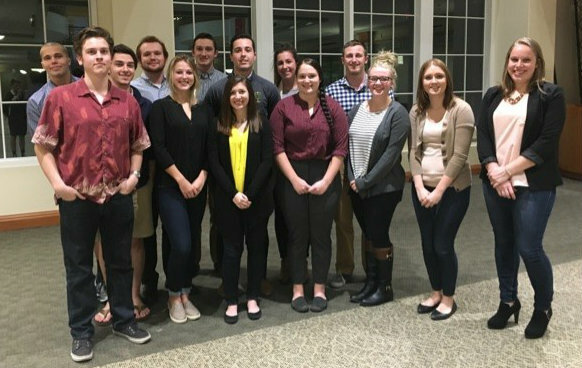 We’re a group of about 20 students and we represent fellow students through our our university judicial process, called “Community Standards.” We work with students and advise them through the entire process, helping them put together a case that brings forward all the relevant facts. We let students know what’s going to happen and tell them about potential sanctions, things like that. We make sure that they know their rights and their due process is upheld. Basically these judicial hearings are fact-finding missions, and both sides are just trying to find out the facts of the story so the right decision can be made. FIRE: How do students find you? SF: We have a really good relationship with Community Standards at our school, so a lot of times, if students are uninformed on the process or a little bit lost, Community Standards will actually bring students over to us for help. We also do tabling during the times of the year when students tend to get in a little more trouble on campus. We also have a website and social media accounts on Twitter and Facebook. FIRE: That’s great that you have such a good relationship with Community Standards. I’d think that at some other schools, the relationship between an administrative body and an administrative watchdog-type student group might be more adversarial. SF: I can’t speak for other universities, but I can definitely see how it might come off that way. For us, the main point we stress is that we’re a due process organization. We’re here to make sure students have their rights upheld. And I think having that relationship with Community Standards really helps us because, not only do we get more clients, but overall the process goes much smoother. If a student does something to get themselves in trouble, we’re not there to necessarily get them out of trouble. We’re there to make sure that their rights are upheld, that their sanctions are fair, and that they feel comfortable with what’s going on so we can help present the best case possible. A lot of times, when students are in these situations, it’s tough for them to talk about everything that happened. They’re in the moment and it’s tough to get everything out. It’s a lot easier for us to do things like help question witnesses, for example, than it would be for the student who’s going through the process. And I think Community Standards understands that. Although we’re trying to help our students as much as possible, we’re not taking responsibility for the students. Their taking responsibility for themselves. FIRE: How long has your program been around? SF: This is actually our 40th anniversary. We have to be one of the longest-running programs like this in the nation. I think our longstanding tradition of really helping out students, and really being good at what we do, is where this good relationship with the university comes from. I think Ohio University does a really good job with student discipline through their Community Standards process. Together, I think we run one of the premier programs in the nation. FIRE: What’s it like when students come to you for help? Ohio University’s Students Defending Students group, spring 2017. SF: We’re in a unique position also being students. Normally, when someone’s in trouble in the real world, they go to a lawyer. We’re just students volunteering, so we have to walk a fine line of being professional and proving that we know what we’re doing and that we’re good at what we’re doing, but that we can also relate to students. FIRE: A student defender program doesn’t sound like the stereotypical fun college extracurricular activity. What is it about this work that appeals to you? SF: I think we’re one of the only organizations that directly helps students. There’s no fluff. I really like that. And I love Ohio University. I came here knowing not one person and I was petrified. When I got here, I loved the university and every opportunity it gave me. So this is a great opportunity for me to give back to my university doing something I enjoy, something that I’m passionate about, and something I think is important. You see around the country students being taken advantage of through their university’s judicial process and that doesn’t sit well with me. It’s a very overlooked process that doesn’t get a lot of attention, and that gives some universities the opportunity to take advantage of students. I’ve had such a great higher-ed experience. I think every student deserves that. FIRE: What’s so fulfilling about this work for you? What are the kinds of positive outcomes that make it worthwhile? SF: We really make sure that a student doesn’t go into anything blind. They always know what’s going to happen. They always know their options and their rights. I think that’s the most important thing. I think the problems come when a student doesn’t know their rights and doesn’t know the possibilities of what can happen. It happens a lot with international students who might not know exactly how the process works, so we work extra with them. We really work to make all students comfortable. FIRE: Tell us more about the other volunteers in your group. SF: There are about 20 of us now, but it used to be much fewer. In recent years we’ve gotten a lot more applicants, so we’re transitioning into a new training process that’s more competitive. I think that’s really helped out our organization to get the best members possible. FIRE: What kind of time commitment is involved in a working for a program like this? And what are you looking for in an applicant? SF: I would say, on average, it’s about 6-8 hours a week and 8-10 for an executive-level member. It really depends on your caseload, which includes prepping your client and then going to the conferences and the hearings after. In regards to looking for qualified students, we’re just looking for the passion to want to help. This work can be very stressful for volunteers to manage with their course loads, and some students have jobs and other commitments. It’s also stressful because you’re dealing with someone else’s — well, really their life. I mean, a lot of times there are very severe consequences that come from these accusations, and you’re the one in charge of making sure they don’t get expelled or suspended. The ability to have time management, confidence in yourself, and that passion for the organization is what we really look for. Just someone who is really committed to it, and not just doing it to build their resume. SF: It comes to a surprise to many people that we exist and help. There’s only about 20 or 25 schools in the nation that have a program like this. I think we run one of the best programs in the nation and I’m really excited to be a leader in the organization here. I love what I do here. Check back here tomorrow for another interview with another student defender. And don’t forget to go to FIRE’s Student Defenders page to learn more about how you can get involved.